I didn't know cherries in the snow is a type of dessert until very recently. 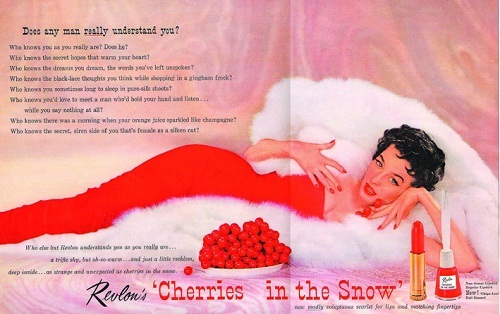 Revlon Cherries in the snow was introduced in 1953 featuring Dorian Leigh (she was one of the first super models in the world!) and it was a cult favorite during the 50's. I think I have read it somewhere that this color was actually changed over the time and I suspect that might be true. The nail polish is so pigmented, I usually just apply one coat never feeling I need to add another one! Application is a breeze, too. The lipstick is as intense as the nail polish. It is so creamy and moisturizing, you wouldn't believe it! 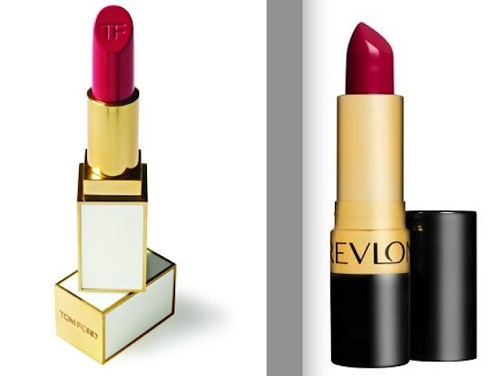 Revlon Cherries in the Snow is actually known as a good alternative for Tom Ford lipstick in Cherry Lush. My only gripe is that there is no way for me to pull this color off in real life! I mean I can wear this as tint (it actually makes a great tint since it is so staining!) or wear it in full strength and play alone at home, but that is not the way to show respect to this amazing color, right? Some say this and Revlon's another retro red Fire & Ice are all you ever gonna need for red lipsticks. Have you tried Cherries in the Snow lipstick or nail polish? I had no idea it was a dessert either! If you keep everything else down would you consider such a shade more wearable? Like just some cat eyeliner and minimal natural-looking blush? wow thats one fiery color! I like the last picture you took,it's so lipstick jungle material lol. red lips and red nails..
Love the nail polish, so pretty. Even with one coat, it is stunning. I had no idea it was such an iconic Revlon product! I love both the polish and the lipstick - so pretty! Gorgeous post - love the food photos, too ;) I like both the lip and nail color - they're stunning! But I totally know what you mean about just wearing it around the house, haha. It takes some kind of bravery to rock those lips! I think you can do it, though - it's an amazing color on you! OMG cherry in the snow looks delish!! Oh my gosh, it's so pretty! I seriously have to run out and buy this shade this week. Love it!! Thanks Lena! I bought that nail polish for my mom last Christmas, she likes reds and I thought it was so classic and a rich, vibrant colour. Your nails look fab. And I think you should wear the lipstick out! Wow, such gorgeous pictures. The colour is truly stunning and looks beautiful on you! Thanks for sharing, the colour looks real pretty both on lips and nails! Love the Tom Ford lippy too! I love both the lip colour and nail polish!! It's definitely a classic! The last pic looks almost like an advertisement. Very cool! this cherry color looks awesome, I love the shade! there are so many antching nail/lip colors, but this one of one of the few that shows up true in both form. i think Tom Ford lipstick is amazing and i think i wanna actually shell out $50 for a lippie! Smoke Red is to die for. i like wearing deeper colors on short-trimmed nails. it would take a lot of courage but i guess i will try it out. lol. i have to agree with you! i am not a big fan of cherry anything but i can't wait to try this dessert. it is quite difficult to pull because it looks like i only have lips if i tone down other makeup and i look gaudy if i add more makeup to balance it out. The red is gorgeous. I have never tried the Cherries in the snow but would love to. I never even heard of it to begin with, so thank you so much for sharing this. they have more number of lippies than polishes, but you can find so many gorgeous matching colors. have fun! Whaaa perfect red for me, I love Revlon !! Those look so yummy!! Let me know how it turns out! Pretty red color! Just stopping by to send some blog lovin your way! Always checking our your adds and sponsors! the color is so beautiful!! i love both the polish and lipstick!! Wow that shade of polish is so pretty- I WANT IT!!! This is indeed a very retro shade of red. It looks really pretty on you though! I agree that it looks nothing like the color in the vintage ad - it actually looks a bit magenta on my screen. It's still a very beautiful color though! Hi hun. I just nominated you for the Versatile Blogger Award.. Congrats!!! the nail color looks amazing!and the lip colour is good too..but that dessert has me totally drooling! I totally think you can wear that lip color out and about! It's a gorgeous, gorgeous red. It would be a waste not to! And oh my word-- the nail polish is really pretty. I can't believe that's only one coat! I actually only have one Revlon polish and I don't really like it since it changes color about 2 days in. Weird huh? Lena, I am LOVING this girl! I didn't know about it. So gonna look for it the next time I go to the store. lol she looks like Milla Jovovich a bit in the picture. hope you like this color, too! it is a shame revlon polish turns on you. i haven't had the problem but it might be the base or top coat. i have the fuchsia color from the colorburst line and i love it, too! matching lips and nails seems to be a trend lately! I love this lipstick and usually can pull off bright lips but I must admit I'm a little intimidated to wear this out in public, too! Beautiful colours!! Wow I love how that nail polish dries! I've never tried any revlon naili polish coz I was scared it wouldn't be as good as the salon quality brands...but I'll totally give it a try now! ¡I Love your post!... ¡I Love Cherries in the Snow!